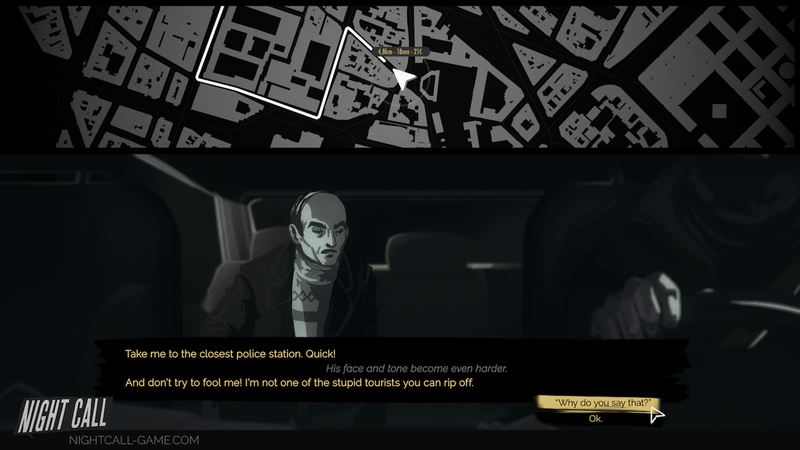 Shacknews caught up with Night Call developers Black Muffin and Monkey Moon at GDC 2019 to chat about this noir-soaked adventure at GDC 2019. Ever wondered what the streets of Paris might look like if they were drenched in the inky black darkness of a noir narrative? You might get something that looks a bit like Night Call. Shacknews caught up with with project leader Laurent Victorino and writer Anthony Jauneaud for a lengthy chat about the upcoming game and everything it has to offer. "We started thinking about the game in 2016 and started working with Raw Fury seriously in 2017. We're almost done with the game and plan on releasing it pretty soon." Night Call follows a serial killer who's prowling the streets of modern-day Paris. Police haven't been able to track the killer down just yet, so your shifts as a taxi driver aren't exactly as safe as they could be. You're right in the middle of a noir-inspired murder mystery that requires you to also make enough money to ensure you can pay all your bills. So you have to juggle being a taxi driver, all the while investigating this grim case, your dual roles presenting conflicting priorities. You'll have to figure out how best to balance them as you focus on solving the crimes happening all over the city. "What we really want to do is something that's dark, weird, funny, and different than what you're used to seeing in games." Night Call is targeting a summer 2019 release. Be sure to subscribe to Shacknews and the GamerHubTV channels on YouTube for the latest videos and news. You can also head back over ot our GDC 2019 hub for all the latest info from the conference.